Welcome to yet another January organizing challenge. This month we're organizing papers and last week, when I introduced the very first challenge there were some of you who were excited to start with their paper clutter and then there were some of you who weren't. For those of you who aren't so excited about starting here, let me just say, I get it. I do, I get that papers aren't the funnest to organize. I get that one can have piles and piles that they have to go through. I get that you most likely won't see the biggest results visually, BUT I will tell you this. The peace that you'll receive when you do get all your papers organized is SO worth it! You'll be happy that you did this challenge. So stick to it and keep following along. You WILL reap the rewards of your hard work. Today is about organizing manuals & warranties. This challenge is an easy one. If you missed any of the spaces that we've already organized you can find the list on the Challenge tab at the top of my blog. All you need to complete this challenge are some 3 ring notebook binders and sheet protectors. Those editable spine labels can be found in my shop. Simply type in and print on label paper. I've created 4 different binders to store and organize my manuals. You can choose to copy mine or if you feel that sorting them differently would work better in your home, then go ahead and do that. 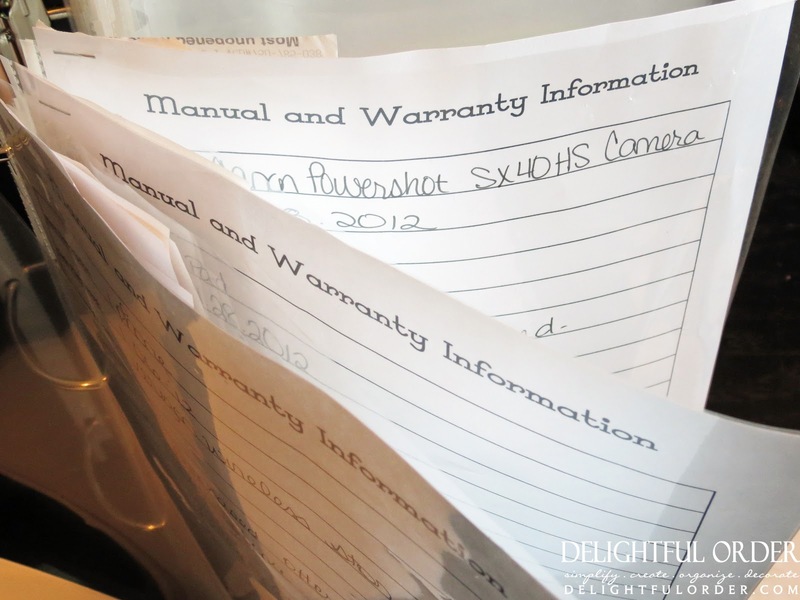 Remember, there is no right or wrong way to organize manuals and warranties. One binder is strictly for my house plan and any appliance that would stay with the home, if ever we were to sell it. When I sell my house, this binder will stay in the home. It includes manuals for the refrigerator, wall oven, dishwasher, microwave, cooktop, garage door opener, fireplace, thermostat, sauna stove, etc. Any warranty information is also placed in the same sheet protector as the manual. irons, car seats, baby swings, outdoor grill, etc. 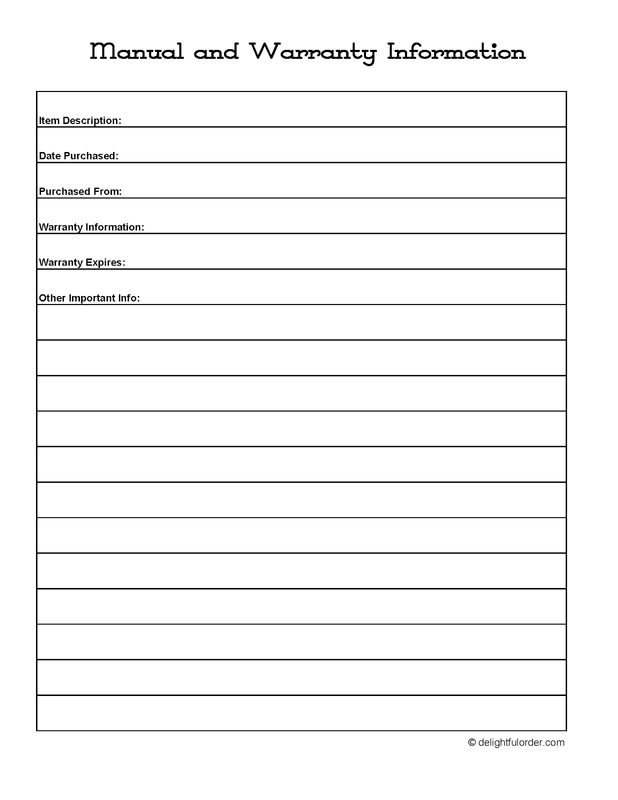 I've printed a few of the Manual and Warranty Information pages to keep track of the item, where and when it was purchased and any other information needed. I staple the receipt for the item to the back of this page. 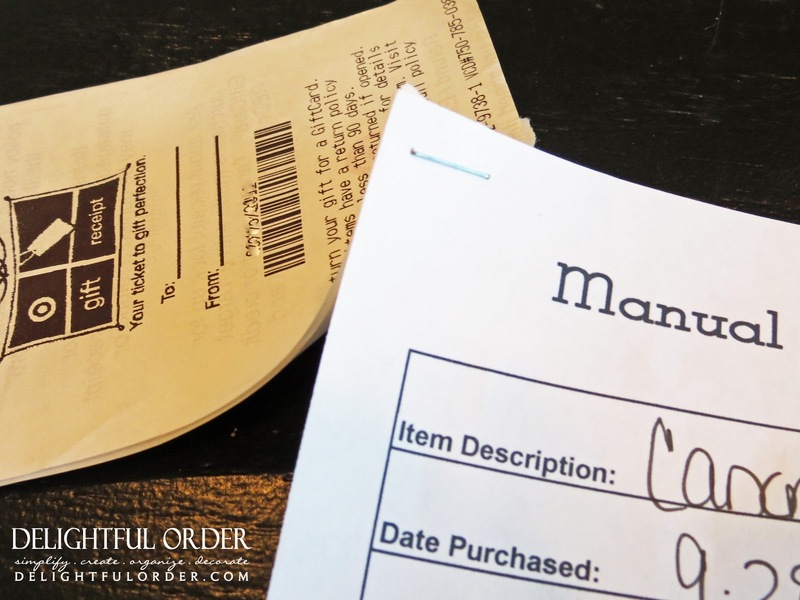 If ever I needed to return the item, the receipt is easily found, as it's right there with the manual itself. I simply slide this page in the same page protecting pocket as the manual. It's so easy to find any manual that I'm looking for with this system. at the back of each book I keep extra page protecting sheets, so that I can add to the binder whenever I get a new manual. Voila! Simple manual and warranties all organized and in their proper places. Remember Printables from Delightful Order are for personal use only. 1. Collect all manuals and warranties that are gathered around your home. 2. 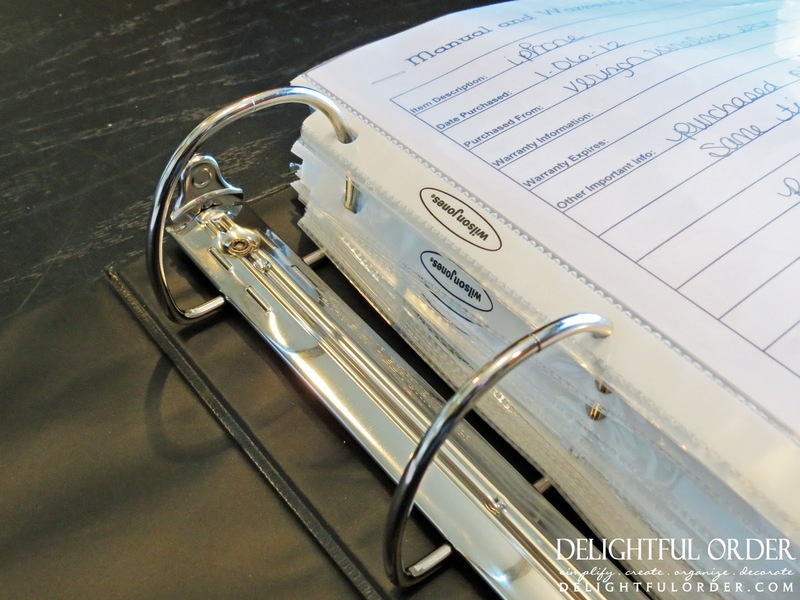 Create different binders for the sections that you want to divide them into. 3. 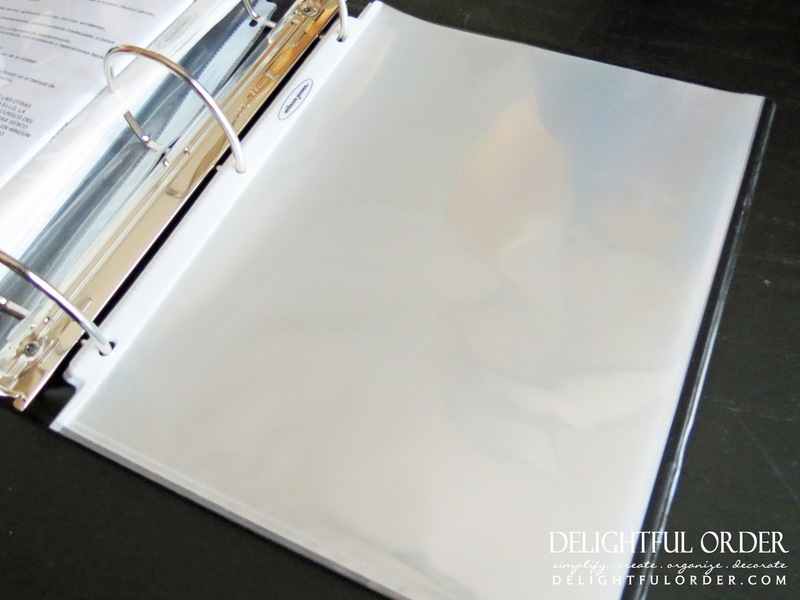 Add sheet protectors to each binder. 4. Add the manuals and warranties into the sheet protectors. and... That's it! Your Done! Easy, right? You CAN totally do this challenge! Great job DaNita! 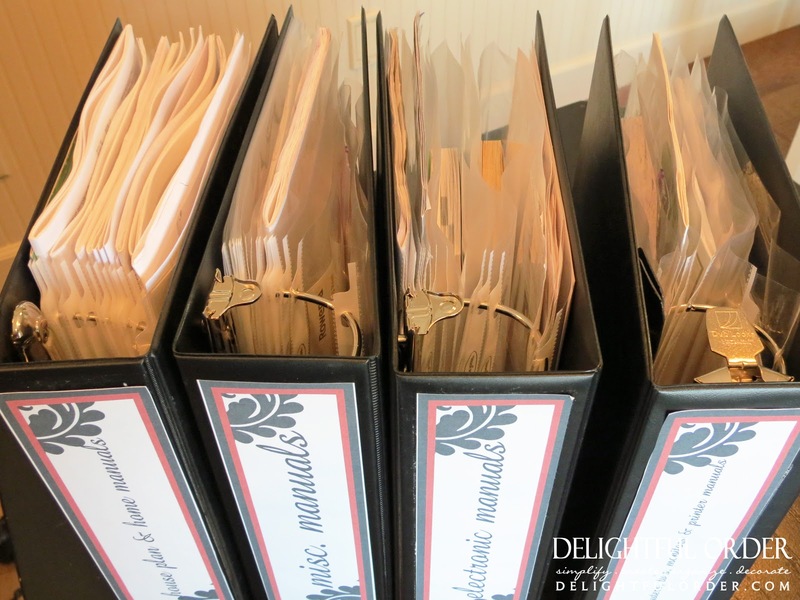 I'm doing a similar thing soon but I'm going to use a plastic file box with hanging folders instead. Love this series! I've got a metal box with hanging files that we use for ours that started off organised but is seriously lacking now. Also got some lying around that should be in there but there's no room. Must get on board with this project. 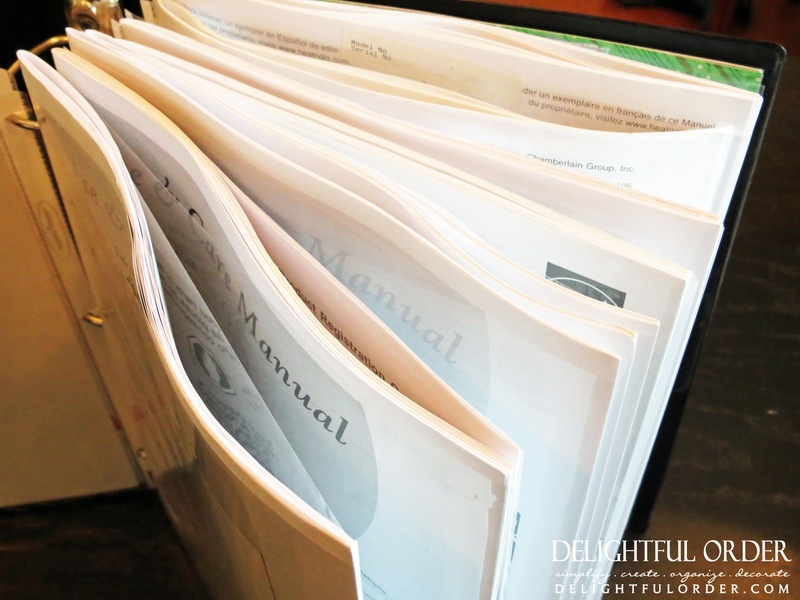 Great idea for manuals!! Right now mine are in a plastic expandable file & let's just say it's not working that well. I may have to give your binder idea a shot! I like the way you've separated it. I actually use a similar system but it's in one giant binder. I find the binder too large and overwhelming and think I'm going to have to change into several smaller ones. I'm big on organizing, too. 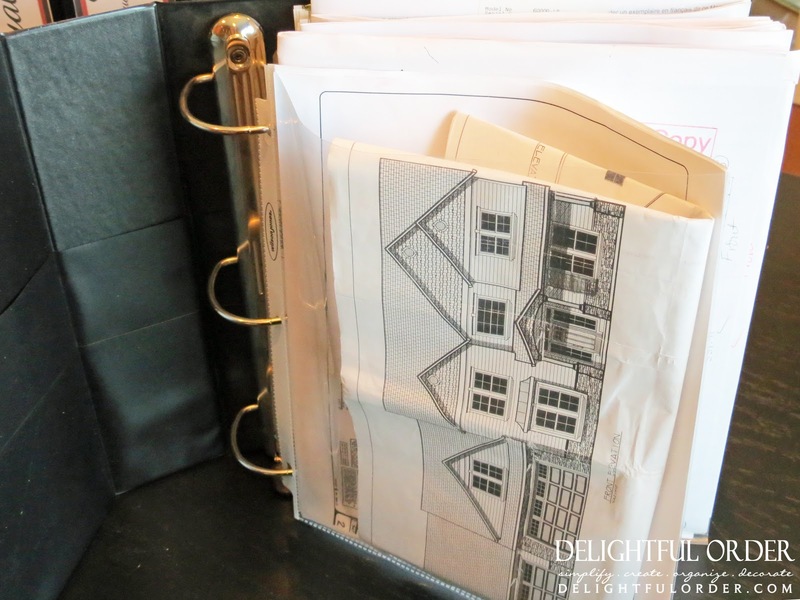 When we bought our house I started a three ring binder for all our appliances, garage door, air conditioner, etc. documents. Comes in handy when something breaksdown or you may want to know who the manufacturer was for a bathroom faucet, etc. After reading your article I'm going to do the same for our everyday gadgets, too. Life is so much easier organized. Thanks for sharing. This looks like a really good idea....but I'm not up to a challenge yet, ha-ha. (Still getting Christmas put away.) This looks like something I can work on a little at at time. Thank you for making this so easy....what a relief it would be to have all of these manuals and warranties squared away - AND accessible. Sure appreciate the free printables - that will help! That is so smart, I need to be more organized like that. Your binders looks so nice and well put together. I'm stopping by from a blog hop and am now following. Feel free to do the same! I love your ideas, I linked you on my blog because I found your labels and ideas so helpful to me. Yes, getting organized was at the top of my resolutions, (well loosing weight is always at the very top). Hope to have some good photos to share at the end of January!! 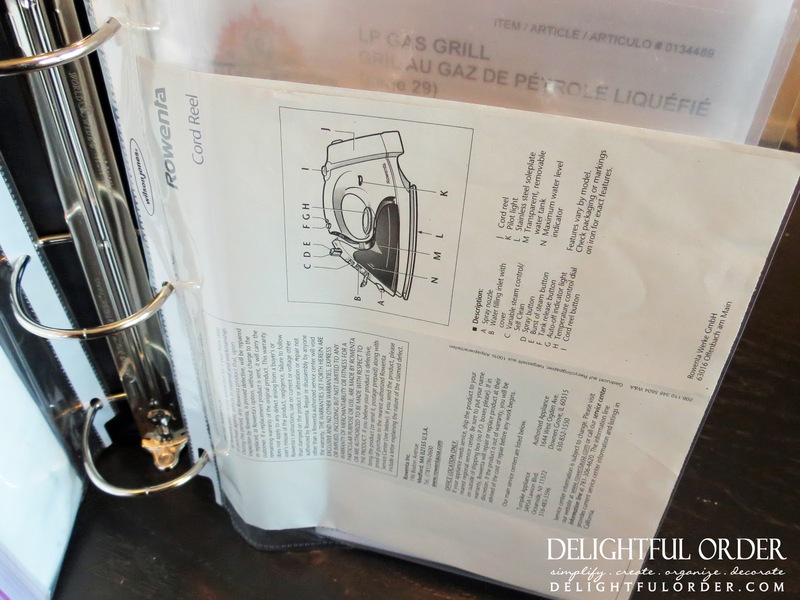 I LOVE the idea of keeping manuals organized. Funny thing is I don't use a lot of manuals myself, but they come in super handy when selling things on ebay and craigslist which I do often. This is a great idea! Thanks for sharing! Great idea. Thank you for inspiring me to clean that stuff up and keep track of it! 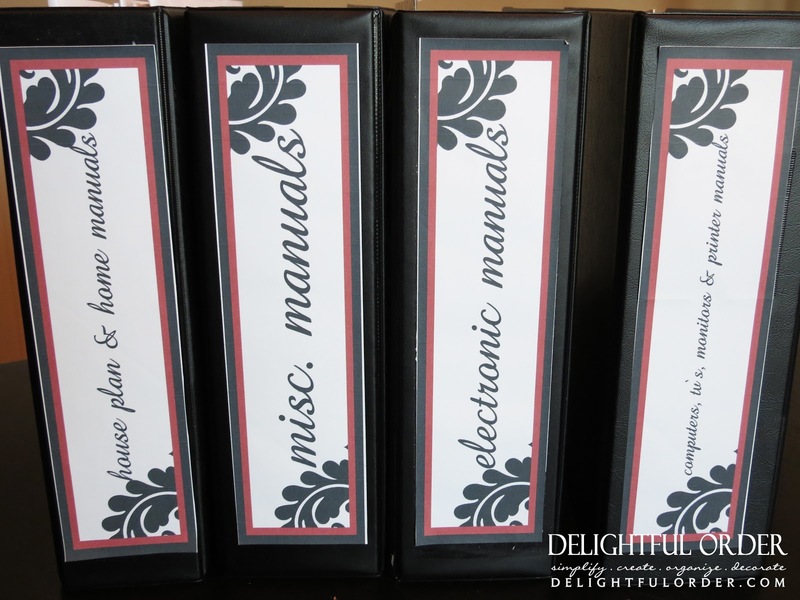 I love the idea of the binders for organizing manuals! I have one question...where do you put the binders? We lack shelf space in our house (books are everywhere!) so while I like the organization, my file drawer still seems to be most logical, even though it's not nearly as simple and accessible. I really just need you to come to my house and help establish some "Delightful Order" around here. I keep my manuals in my craft room/office closet on a tall bookshelf. If you don't have extra room for a bookcase (or simply need the bookcase for books) just use whatever system/storage that works best for you and your household. OK. I'm with you on setting up binders for manuals and warranties. But, where do you keep your binders? Just curious. OMG!!! This is exactly what I have been needing... I am a young mom just starting out and I have been needing some help with organization and such. I have just never had the motivation to do so simply because I dont know where to start. This whole monthly challenge thing is such a great idea and helps me out so much.... never did I know there was so much in filing papers. This just breaks it all down and opens my eyes that there's so much more to it than what I thought. I love to be organized and have lists, plans and my calendar all marked up and highlighted so that every event like doc. appt. and meetings are all color coated. My fiance just shakes his head at me whenever he sees me doing something like that but it honestly makes me feel so much better and I feel so relieved when I'm organized. So thanks so much for this site and I will start doing the challenges tomorrow being that today is the first time I have seen this website/blog. Now I know where to start and I love that its step by step and that you share how you organize your planner etc. It gives me ideas and I go from there. And besides I love crafts so personalizing this stuff is right up my ally and makes it more enjoyable!!!! P.S. Saw this advertised on Pinterest! Just stumbled across your blog last night and I love it! 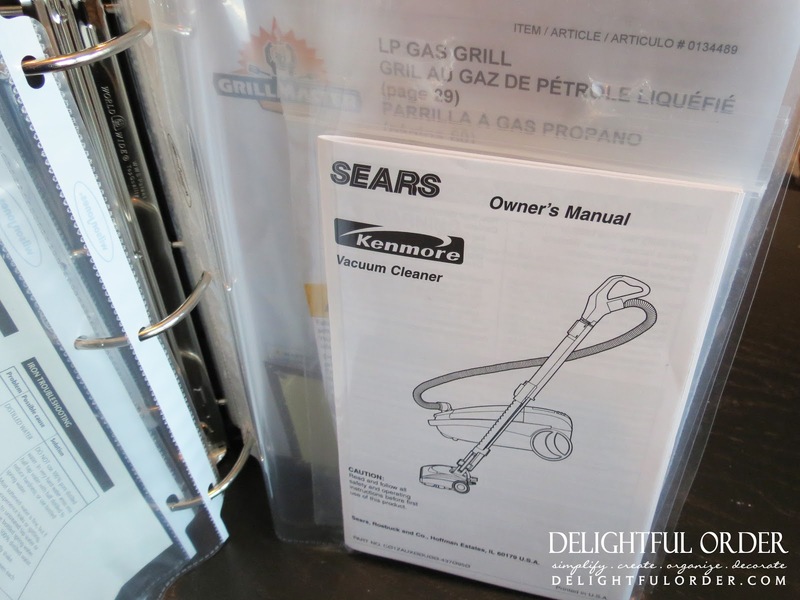 I have a similar system for filing my manuals except I have always been stumped on what to do with all the "extras" you sometimes get, like the hardware you get with your oven to prevent it from tipping over, or the little "balancing" pieces for the ceiling fans. Some of the extra hardware is just too big or bulky to put into a binder. Any suggestions for those?